For the description of the implementation of TCDFT in ABINIT see [Wiktor2015]. The user should be familiar with the four basic tutorials of ABINIT and the first PAW tutorial. This tutorial should take about 2 hours. Before beginning, you might consider to work in a different subdirectory as for the other tutorials. Why not Work_positron? cp ../tpositron_x.files . # You will need to edit this file. Calculation of the ground-state electron density without the positron. Calculation of the ground-state positron density in the presence of the electron density from step 1. 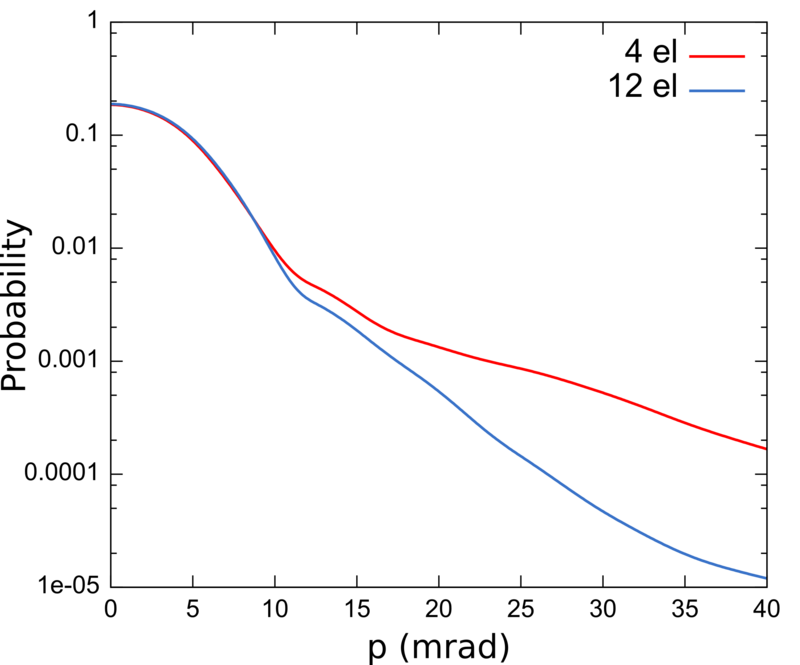 The two densities are used to calculate the positron lifetime, which is proportional to the inverse of the overlap of the electron and positron densities. This 2-step calculation, considering the zero-positron density limit, corresponds to the conventional scheme (CONV). In the tpositron_1.in file, you will find two datasets. posocc2 1  ! Occupation number for the positron (should be set <1 for bulk calculation with a small cell).
! Here the zero positron density limit is used, so results do not depend on posocc. Here we set positron=1, which corresponds to a positronic ground-state calculation, considering that the electrons are not perturbed by the presence of the positron (zero-positron density limit). The electron density is read from the file resulting from dataset 1. As we consider the positron to be completely delocalized, we only consider the Γ point in the Brillouin zone. The keyword ixcpositron selects the electron- positron correlation functional and enhancement factor. In this calculation we use the functional parametrized by Boronski and Nieminen [Boronski1986], using the data provided by Arponen and Pajanne [Arponen1979]. We can now run the calculation. In the directory ~abinit/tests/tutorial/Input/Work_positron, copy the files ~abinit/tests/tutorial/Input/tpositron_x.files and tpositron_1.in. This calculation should only take a few seconds. The lifetime of 223 ps agrees well with the value of 225 ps calculated with the same number of valence electrons in [Wiktor2015] and with the experimental value of about 219 ps [Panda1997]. We will now perform a positron lifetime calculation for a monovacancy in silicon in the conventional scheme (which we applied to the perfect lattice previously). Note that when the positron localizes inside a vacancy, the zero- positron density limit does not apply anymore. However, in some cases, the conventional scheme proved to yield results in agreement with experiments. 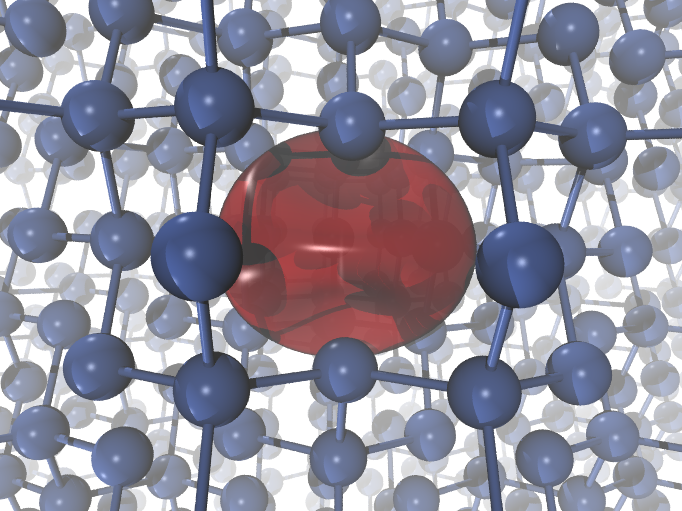 For the purpose of this tutorial, we generate a defect in a cell containing only 16 atoms. This supercell is too small to get converged results, but the calculation is relatively fast. posocc2 1.0  ! Occupation number for the positron (should be set <1 for bulk calculation with a small cell). We observe that when the positron localizes inside the vacancy, its lifetime increases from 223 to 247 ps. This is because now the majority of the positron density is localized in the vacancy region, where the electron density is small. The overlap of the electron and positron densities is reduced, and the lifetime increased. posocc 1.0  ! Occupation number for the positron (we have one positron in the cell). This calculation is significantly longer than the previous one, because the electron and positron steps will be repeated until the convergence criterion is reached. Once the calculation is finished, look at the positron lifetime in tpositron_3.out. Including the self-consistency increases the positron lifetime, because its localization inside the vacancy becomes stronger when the positron and the electron densities are allowed to relax. Don’t forget to put tpositron_4.in in tpositron_x.files. In this calculation we switched on the atomic relaxation by setting ionmov = 2. We need to calculate forces to be able to move the atoms, so we set optforces = 1. In the provided tpositron_4.in file, we only perform 4 relaxation steps (ntime = 4) to save time, but more steps would be needed to converge the positron lifetime. Although the results at ionic steps 3 and 4 differ from each other by less than one percent, they differ by more from the final result. The one percent convergence is only reached at ionic step 5 and after. Also, remember that the 16-atom supercell is not large enough to get converged results. In Table IV of [Wiktor2015] you can see converged results of the positron lifetime of Si monovacancy within various methods. In the last part of the tutorial we will calculate the electron-positron momentum distribution (Doppler spectrum) of a silicon lattice in the conventional scheme. This type of calculation is much more time and memory consuming than the lifetime calculation, as it is using the electron and positron wavefunctions (not only densities). Now take a look at the input file tpositron_5.in. posnstep  2     ! We simulate a delocalized positron, so we only perform two steps of electon-positron calculations.
! It means that the electronic wavefunction is not affected by the positron.
! so the full grid needs to be specified. posocc 1.0   ! Occupation number for the positron (should be set <1 for bulk calculation with a small cell). This grid is used in both electron and positron calculations, but only the positron wavefunction at the first point is taken in the momentum distribution calculation, so the \Gamma point should always be given first. In the calculation of the momentum distribution, we need to include both core and valence electrons. The wavefunctions of the core electrons are read from a file (one per atom type), which needs to be provided. This core WF file should be named <psp_file_name>.corewf (where <psp_file_name> is the name of the pseudo-potential (or PAW) file) or corewf.abinit<ityp> (where <ityp> is the index of the atom type). Core WF files can be obtained with the atompaw tool (see the tutorial on generating PAW datasets (PAW2) ) by the use of the prtcorewf keyword. You will find the core wavefunction file used in this calculation in $ABI_PSPDIR/Si.LDA-PW-paw.abinit.corewf. Once the calculation is complete, you can find a tpositron_5o_DOPPLER file containing the momentum distribution on the FFT grid. You can use the ~abinit/scripts/post_processing/posdopspectra.F90 tool to generate 1D projections (Doppler spectra) in (001), (011) and (111) directions and to calculate the low- and high-momentum contributions to the momentum distribution (so called S and W parameters, see [Wiktor2015]). The positron lifetime and momentum distribution calculations within the PAW method are very sensitive to the number of valence electrons in the PAW dataset. It is due to the fact that it is not easy to describe the positron wavefunction, tending to zero at the nucleus, using the electron atomic orbitals. The PAW basis set in this case needs to be more complete than only for describing the electron wavefunctions. The simplest way to make the PAW dataset more complete is to include semicore electrons. It is also possible to add the partial waves corresponding to the semicore electrons in the basis used only for the positron wave function description, while keeping the initial number of valence electrons (as done in [Wiktor2015]). However, this second method is less straightforward. This value is significantly lower than 223 ps achieved with 4 valence electrons in the first step. It is, therefore, very important to always test the PAW dataset completeness for positron calculations. The dataset with 4 valence electrons is not complete enough to describe the positron wavefunction around the nucleus. This is reflected in the unphysically high probability at high momenta in the spectrum. Further explanation of the influence of the PAW dataset on the Doppler spectra can be found in [Wiktor2015]. In case you need to generate your own dataset for momentum distribution calculations, you can follow the tutorial on generating PAW datasets (PAW2).